Two letters from the secretary of the India office were sent to Daftar Taraqqi-e-Islam for presenting to Hazrat Khalifatul Masih, may Allah be with him and help him with divine support. Due to the postponement of this journey, I travelled to Torquay. 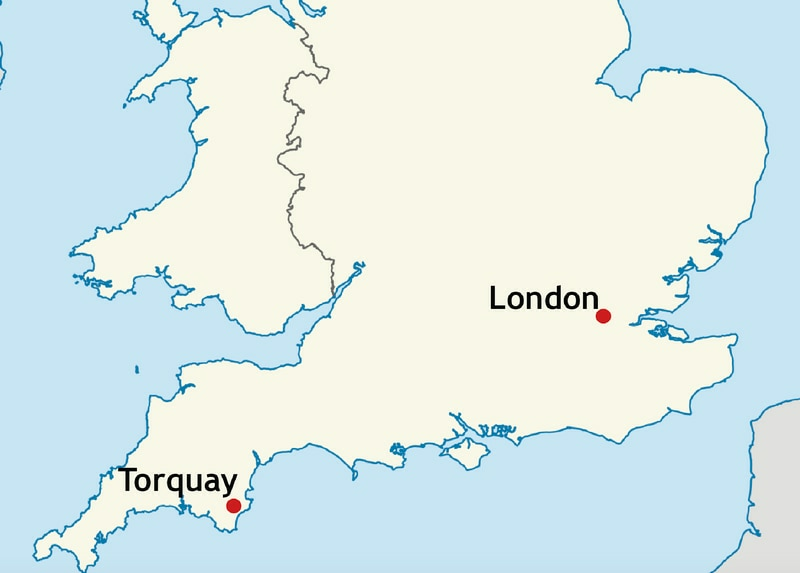 This town is situated in the south-west of England, approximately 200 miles from London. I set off at 10am from London and got to Torquay at around 2:30pm. It was a direct train. This area is lush green and the air here is pure. It is said that compared to London, the cold is not so bitter here. Thus far, I have noticed nothing different other than the fact that the sun stays out of the clouds far longer than it does in London. 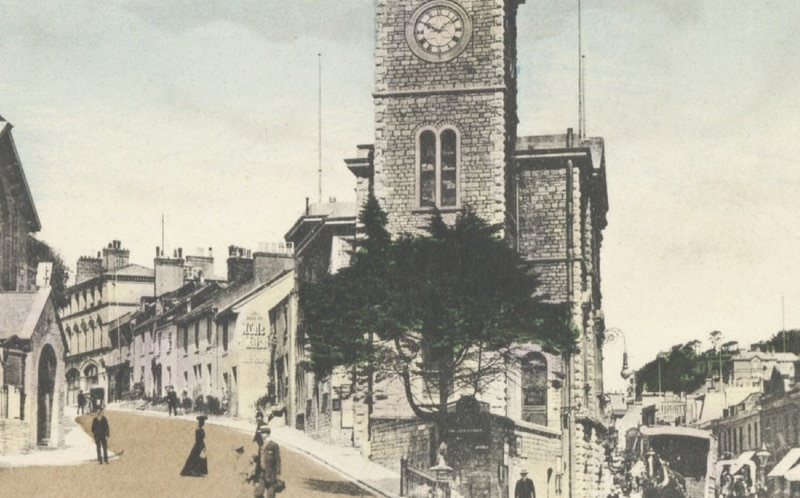 On 8 November, there was a gathering of dignitaries in the Torquay town hall. One of the board members delivered a lecture on how towns are formed and how they can be managed. On such a subject, at first I saw no opportunity for me to speak, but my heart did not accept that whilst being present there, the gathering should be bereft of the remembrance of Allah. The report of this speech was given in the newspapers the Torquay Times and the Torquay Directory on 15 November . Both newspaper cuttings have been sent to Master Abdur Rahim Nayyar Sahib so that they may be given to the appropriate English magazine or journal. On the evening of 5 November, an event was held in this church and I too participated. The organiser of the event said that if I wished to speak, then 5-10 minutes could be allocated for me. I responded affirmatively. Thus, in a brief speech, I spoke on the need of revelation and proofs in support of the door to divine communication still being open. It had a positive impact on the audience. After the speech, I had the chance to speak to some ladies about Islam Ahmadiyyat in detail. Two of those ladies visited the house where I stayed and I had the chance to preach to them. Very happily, they took the Bai‘at form with them to ponder over it. May Allah bless their decision and may He bring them towards Islam. Amin. 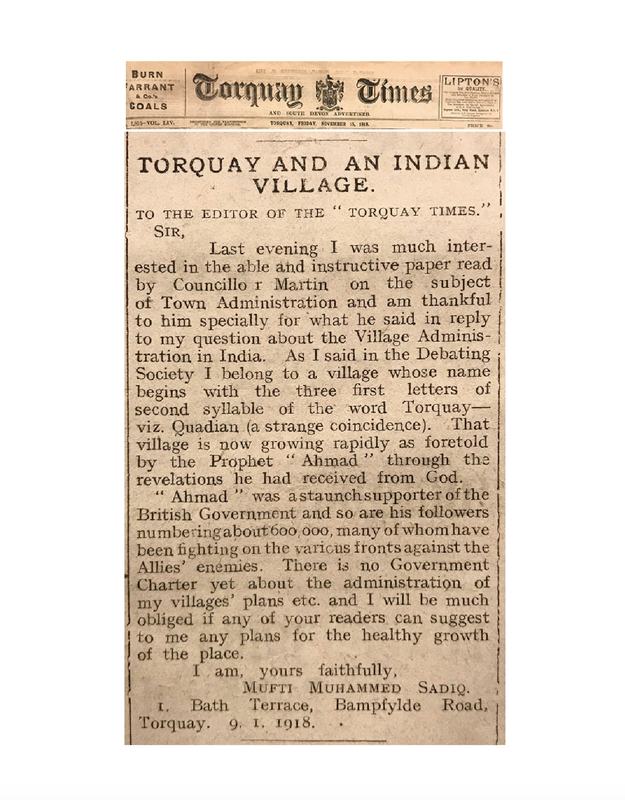 The local newspaper, the Torquay Directory, published a report on this brief speech on 12 November  with the heading [translated from Urdu] Address of an Eastern Scholar. I usually purchase those newspapers that include mention of the Jamaat or about us and send the cuttings of articles to friends. Regrettably, within the given budget, this is not possible anymore and I have had to discontinue this. However, should anyone desire for me to continue sharing such newspaper articles, they should send some money and I shall carry on sending such newspapers with their help. The funds can be sent via postal order. This is all correct, but the larger part of India’s contribution is that a prophet of Allah belonging to India not only foretold this war, but he prayed for the British monarchy’s victory. I wrote an article on Turkey’s recent attempt of conciliation and it was published in the Torbay News newspaper, the title of which was [translated from Urdu] Another Prophecy Fulfilled. In this article, I showed that one of the major errors made by Turkey in terms of the war was that they termed it a religious Jihad, hence their defeat. The newspaper cutting of this article has also been sent to Master Abdur Rahim Nayyar Sahib. The same cutting was sent to the prime minister of Great Britain, along with a letter of congratulations upon our victory. He acknowledged receipt of this letter on 12 November 1918 in a letter written to me. A copy of this letter has also been sent to Qadian. A memorial service was held in a popular place of central London for the fallen soldiers of the war, where a platform full of flowers was put up. Those people who lost dear ones and friends bring bouquets in memory of their loved ones with notes attached to the bouquets with names of the love ones and some words in their praise. After a while, to make space for more flowers, all old flowers and papers are removed. It has been announced that all papers will be stored safely and after some time, they will be preserved permanently. “In memory of our dear Ahmadi brothers, who sacrificed their lives in the days of war for the beneficent British government, because it was the instruction of their spiritual leader, Hazrat Nabiyullah [prophet of Allah] Ahmad Qadianias, the Promised Messiah and Mahdi, to always remain loyal and obedient to their government and to serve and help the British Government. Hazrat Nabiyullah foretold this war well before its time and prayed for the British monarchy that it may hail victorious. These soldiers served in France, Egypt, Dardanelles, Syria, Iraq, Arabia etc. May God’s mercy descend upon those who fell and those who lost their lives as a result of their injuries. O Benevolent God, grant them paradise. Amin. “Mufti Muhammad Sadiq and Qazi Abdullah – Ahmadi preachers. 4 Star Street, Paddington, London. November 1918. This is the [English from the Urdu] translation of the note that was written and placed there. Thousands of people travel to central London to see this memorial and read these notes. According to the revelation of God that a disease would spread in Europe, influenza is killing thousands of people. In some households, there have been three or four deaths as a result of this. It is getting more and more difficult to seek medical attention from doctors. Aside from Europe, we have received news of it spreading its ghastliness in America, Africa and many other places. A friend from Nigeria wrote that the disease has claimed two thousand lives. May Allah save everyone out of His grace, benevolence and mercy and may He cause everyone to come to the right path, accept the prophet of the time and be saved from His wrath. Amin. A doctor has published his views that the disease started as a result of consuming pork, and due to it being contagious, it has spread. Its actual name is swine fever, which results from eating pork. During the war, swine meat was not sold as fresh as it was before the war, and after it had gone bad, it would be included in foods and influenza bacteria would spread in that meat. That is how, he suggests, the disease started. In a previous report [published in Al Fazl on 24 December 1918] I wrote that Khawaja Kamaluddin Sahib was scheduled to deliver a lecture in Scarsdale [or Scarborough] Studios on 25 October , but due to being ill, he was not able to attend. Accepting the request of the organisers of the event, I delivered a lecture in his place. The topic of his lecture was Treading Humbly in the Sight of God. I changed the topic to An Example of Treading Humbly in the Sight of God – Hazrat Ahmad Nabiyullah’s Life and Teachings. Friends will have read in the newspapers that Prince Higashifushimi Yorihito of Japan arrived in England as a guest of our king, George V. He was shown great courtesy and regard in this country. On this occasion, I wrote him a letter on a green tabligh form in which I, on behalf of the Ahmadiyya Jamaat, congratulated him on his successful visit and victory in the war. Along with the words “Ahmadiyya Jamaat”, I explained that the founder of the Jamaat, Hazrat Nabiyullah Ahmadas, the Promised Messiah and Mahdi was a resident of Qadian. With the thought that Torquay would not be as cold as other places, I set off for Torquay. As of yet, I have not found the cold any different to that of London. For this reason, I have returned to London. My intention is to try and spend summer in London. If the cold becomes unbearable, then I shall shift to Ventnor or some other place for a few months, or if my passport is approved for travelling to Africa, then I will have to travel there for a few months. In all cases, my postal address will remain the same, and the mail sent here will, Insha-Allah, reach me wherever I am. I was in Torquay the day the war ended. There were scenes of jubilation in the entire town. Soldiers would march the streets, beating their drums and singing songs. The flags of Great Britain, the USA and other ally nations decorated houses and doors. Small children jumped around and danced in the streets with little flags in their hands whilst singing songs. Church bells were ringing from all corners in joy and celebration for the war having come to an end. I have heard that the same was the case in London. The newspaper cutting of this article has also been sent to Hazrat Khalifatul Masih.